Are you a person who wants to become a world famous breeder? Or maybe you just want to breed for the fun of it. Or maybe you want to breed the perfect pokemon for contests and battling. No matter the need, this place is the place for you! In this first section of the Official Ultimate Pokemon Guide, we will explore the basic fundamentals of breeding pokemon, useful tips, and even include breeding information on all kinds of different Pokemon! Breeding Pokemon was introduced in Generation II, so it is a relatively old gamestyle of the Pokemon Gameboy series. However, it has changed throughout the years as the games have evolved. This Breeding section will discuss breeding as it is known to the HeartGold & SoulSilver Pokemon DS Gameboy games. As review, you need two pokemon (of different gender) with the same Egg Group. You might be wondering; "How do I figure out what Egg Group my Pokemon is in?!". No need to worry. At the end of this section. I will provide a comprehensive list of every single pokemon and their respective Egg Group. The next point of interest is where you breed Pokemon. You may think that carrying the Pokemon in your bag bag will produce a baby. Sorry, it wont. What you need to do is take it to a daycare. In HeartGold & SoulSilver, a daycare is located directly south of Goldenrod City, on Route 43. Once you have your pokemon that you wish to breed chosen, give them to the daycare lady inside the building. She will charge you $100 for every level that your pokemon gain. So, this is where you will place your pokemon if you wish for them to breed. Same species, Different ID Numbers: 69.3%. The old man will say "The two seem to get along very well"
Same Species, Different ID Numbers: 49.5%. The old man will say "The two seem to get along"
Different Species, Different ID Numbers: 49.5%. The old man will say "The two seem to get along"
Different Species, Same ID Numbers: 19.8%. The old man will say "The two don't seem to like eachother"
Different Egg Groups, Sam Genders, or No Egg Group: 0%. The old man will say" The two prefer to play with other Pokemon than each other"
Every 256 steps that your player takes, the game decides whether or not there is an egg at the daycare center, based upon these statistics. For example, if I put two charmanders into the daycare with different ID numbers, every 256 steps I take, there will be a 69.3% chance that there is an egg waiting for me at the daycare center. You will know if there is an egg ready by talking to the man or if he is facing the road (Generation IV). In addition, when he asks you if you want the egg, you will have two choices: Yes and No. If you choose Yes, the egg will be deposited in your Pokemon party (unless you have no open slots. If this is the case, the old man will hold on to the egg until you have a free spot open). If you choose No, the man will keep the egg forever. There will be no way for you to retrieve this particular egg again. If you accidently clicked No, do not worry. Just keep walking and wait for another egg to appear. Ditto: However, one problem with breeding is that not all Pokemon want to breed. Or, sometimes, you want to just breed a certain type of Pokemon over and over again, but an undesired Pokemon keeps appearing (due to the other parent being of a different species). This can be solved with a simple pokemon called Ditto. When Ditto is bred with a Pokemon (except Nidoqueen, Ditto, and Pokemon belonging in the No Egg category), a baby of the other Pokemon will be hatched from the resultant egg. This can be very useful when breeding for natures or mass-breeding certain Pokemon. Breeding for Natures: You probably have tried to breed for a certain nature. Well, there is a little item that is very useful in this endeavor, the Everstone! Whichever Pokemon is given the Everstone, that Pokemon's nature will have a 50% of being passed down to the baby, regardless of gender or if it is breeding with a Ditto. For example, if I am breeding a calm Ditto and a modest Persian, if I give the Persian an Everstone, there is a 50% chance that the baby will be a modest Meowth and a 50% chance that it will be one of the 25 natures. Unfortunately, this little trick will not work if the Pokemon which you are attempting to breed are from different real-world countries. For example, the Everstone will have no effect on the baby's nature if the parents are a Bulbasaur (Japan) and a Shroomish (USA). Breeding for Shininess: Another interesting trick is one that deals with breeding for shiny Pokemon. There are rumors that breeding two shiny Pokemon will increase the chances of hatching a shiny Pokemon. Or that even breeding one shiny and one non-shiny Pokemon will increase the chances of the baby being shiny. These rumors are false. There is only one way to increase your chances of breeding a shiny Pokemon, and that is by breeding Pokemon of different real-world countries. 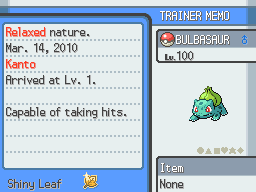 If I breed two Bulbasaurs (both from the USA) there is a 1/8192 chance that the baby will be shiny. However, if one Bulbasaur is from Spain and the other is from Japan, then there is a 1/2048 chance of the baby being shiny. This is due to some special programming written in by director Junichi Masuda. This was meant to promote trades between countries. Interesting eh? These items sole-purpose is to be traded for another item or for some service. These are not key items due to the fact that they are not important to the story of the game. Description: This stone does not intiate any evolution. Instead, it hinders evolution. If you give this item to a Pokemon, it will never evolve, as long as it is holding the Pokemon. However, once you remove the stone, the Pokemon will be able to evolve again. Description: This item initiates the evolution of Rhydon into Rhyperior. In order for this to happen, Rhydon must be holding the Protector and then traded to another player. Description: This item initiates the evolution of Porygon into Porygon2. In order for this to occur, Porygon must be holding the Up-Grade. Then it must be traded to another player. Description: This item initiates the evolution of Porygon2 into Porygon-Z. In order for it to evolve, Porygon2 must be holding the Dubious Disc and then be traded to another player. Description: This item can initiate the evolution of Sneasel into Weavile. In order for this to happen, Sneasel must be holding the Razor Claw and level up at night. Description: This item initiates the evolution of Gligar into Gliscor. For this to happen, Gligar must be holding the Razor Fang and then be leveled up at night. Description: This item initiates the evolution of two Pokemon. For both of these evolutions to occur, the Pokemon must hold the Metal Coat and be traded to another player. Description: This item induces the evolution of two Pokemon. For both of these evolutions to occur, the Pokemon must be holding the King's Rock and then be traded to another player. Description: This item initiates the evolution of Magmar into Magmortar. In order for Magmar to evolve into Magmortar, Magmar must be holding the Magmarizer, then traded to another player. Description: This item induces the evolution of Electabuzz into Electivire. In order for this evolution to occur, Electabuzz must hold the Electrizer and then be traded to another player. Description: This item initiates the evolution of Happiny into Chansey. In order for this to occur, Happiny must be holding the Oval Stone and then be leveled up during the day. Description: This item induces the evolution of Clamperl into Gorebyss. This occurs when Clamperl is holding the Deepseascale and is traded to another player. Description: This item initiates the evolution of Clamperl into Huntail. For this to happen, Clamperl must hold the Deepseatooth and then be traded. Description: This item causes Seadra to evolve into Kingdra when it is holding the Dragon Scale and is traded to another player. Description: This item initiates the evolution of Dusclops into Dusknoir. This is done when Dusclops is holding the Reaper Cloth and is traded to another player. sure why not let me just promote you to moderator(could you finish esplaining types please) ^^ oh and edit it dont create a new post. do i need to accept something to become an admin? Hey guys, thanks for helping out ^^; I might now be able to this week because I'm flooded with homework But I'll help out when I can! But, anyways, please continue. Wow I never have actually seen any website with the odds for getting an egg. Thank you. Yeah you should finish working on it! yeah. it would. though maybe more of us should work on it? updates are coming to the guide. pay attention. Hey guys. Let me know what you think should be added or changed about the Ultimate Guide. I know some things are not obviously finished, but still let me know your thoughts. Thanks! is there a nature guide?? oh, no, there isnt. that is really important, haha. okay..what about if a move is physical or special? will that include evo stones and evolutionary items?? okay! maybe u should put the listed pokemon in a chart so they can be looked at easier?! are you talking about the PokeDex? not me! um.......bout before the pokedex needs to be neater!!! what do you think of the Evolutionary Items section so far? looks good so far!! i want a berrydex/itemdex with locations and descriptions!! that would be awesome! !